DPA recently supplied a large order of Ground Mount racking to Solar Mad in Griffith, NSW. 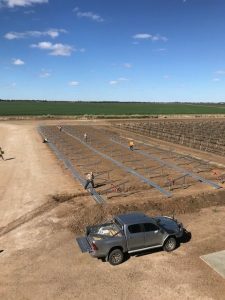 Darren Maddison and Brian O’Sullivan of Solar Mad have installed many DPA ground mount systems and had a new customer wanting a 140 kW array with a special 15 degree pitch. DPA arranged a special order from our supplier and had it freighted directly to Griffith. Please contact DPA for special ground mount projects and we will see if we can help you out.